11/18/2018 11/19/2018 Uncategorized1 Comment on Assumptions Behind The Default (CDR) Model. A reader has questioned the model I use for calculating defaults (CDR) and loss severity. It was pointed out that my model uses the expected P&I, even though a stated percent of principal is in default each month. The reader also pointed out that my model is not the same as the Bond Market Association’s Uniform Practices and Standard Formulas: https://www.sifma.org/wp-content/uploads/2017/08/chsf.pdf. I felt obligated to defend the model I use. Even though the model I use does not conform to the model adopted by the Bond Market Association (BMA), it does not mean that the BMA’s model is the only way CDR can be applied. The key to the model I use lies in the use of sequential principal balances (see the example below). In my model, for each month, it is assumed that all the expected principal is paid by the borrowers by the end of the grace period (let’s assume the 15th of each month). That produces a principal subtotal that the percent of prepayments (CPR) are than applied. After the prepayments have been applied, that produces another principal subtotal. A graphic depiction of the process is on the attached Excel workbook, sheet “Default Model” and below on this page. 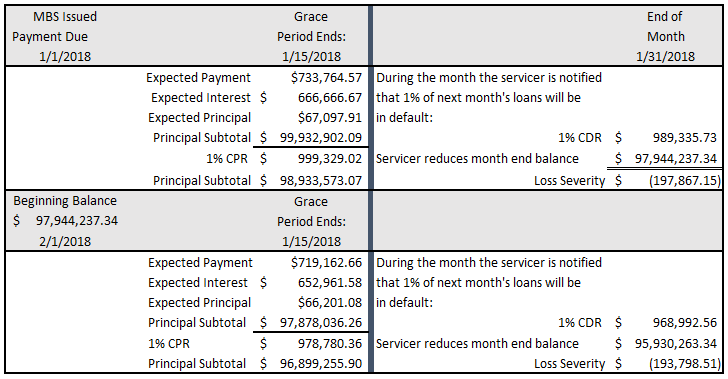 During the month (I used the second half of each month in my example to clarify the math, but it can be anytime during the month) the servicer is notified that a certain percent of loans will be in default next month. The servicer reduces that percent from the principal subtotal balance this month. The new ending principal balance for this month, is also the starting principal balance for the next month. Both models assume the same definition for loan defaults and prepayments (CPR, CDR, PSA and SDA). The BMA’s model assumes the percent is applied to the month’s beginning value, where the model I use assumes the default percentage is applied the principal balance after expected and prepaid principal. Models are comprised of various assumptions. There are numerous models for predicting defaults. Neither of these two models here have any chance of being a precise predictor of future events. That is why they are called models. Originators of MBS would need to use BMA’s model to be in compliance with industry standards. The typical reader of this blog, however, would most likely be on the buy side of MBS with guaranteed P&I and not be concerned with defaults. Defaults do increase the prepayments to the owners of guaranteed MBS but increasing the CPR can compensate for that. Firms that buy and sell whole loan pools between each other, such as banks, credit unions, and underwriters will continue to find my default model a creditable measurement of credit risk. I have left out guarantee and servicing fees to make the data simpler.